Victoria uses a variety of Pilates equipment with both her private clients and group classes. 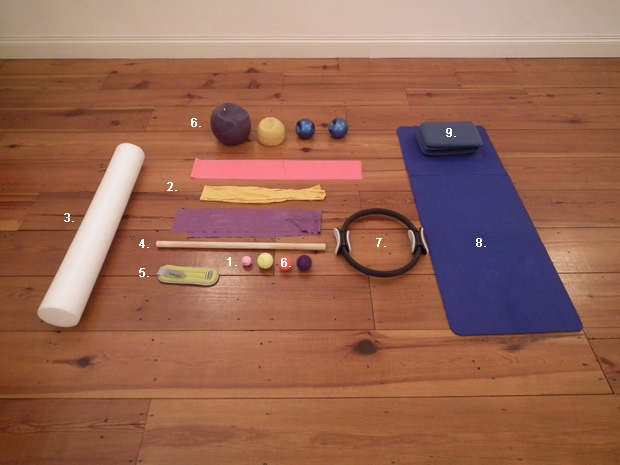 The huge variety of equipment can be seen here in the photographs taken at Victoria’s Pilates clinic and includes tennis and golf balls (1); resistance bands (2), foam rollers (3), broomsticks (4), leg and hand weights (5), the over and gym balls (6), spikey and traid balls (7), power ring, mat (8) and cushions (9). Don’t forget to breathe – We all tend to hold our breathe when under pressure at work or feeling anxious so remember our wide and full breathes when you feel the stress creeping in..
Where possible aim to spread your weight evenly throughout each foot taking notice if you tend to place your weight more through the ball or heel of the foot or even the inside or outside edge of the foot and correct.